South Africa’s energy transition has become a highly topical, emotive and politically contentious topic. Taking a systems perspective, this book offers an evidence-based roadmap for such a transition and debunks many of the myths raised about the risks of a renewable-energy-led electricity mix. Owing to its formidable solar and wind resources, South Africa has an almost unparalleled opportunity to turn solar photovoltaic and onshore wind generators into the country’s power generation workhorses – a role hitherto played by coal. 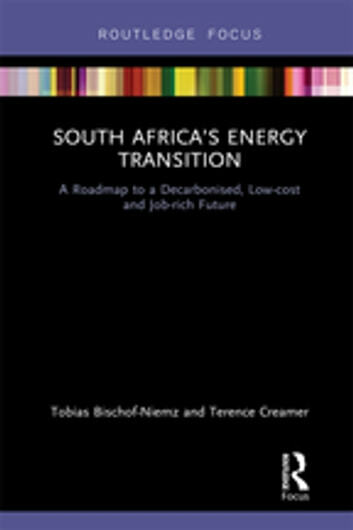 This book shows that a renewables-led mix will not only provide the lowest cost, but will also create more jobs than any of the alternatives currently under consideration. In addition, it offers a glimpse of how South Africa’s low-cost and decarbonised electricity system can power a competitive industrial economy, an electric-mobility revolution and, in the long run, create new export opportunities. This book will be of great interest to energy industry practitioners, as well as students and scholars of energy policy and politics, environmental economics and sustainable development.